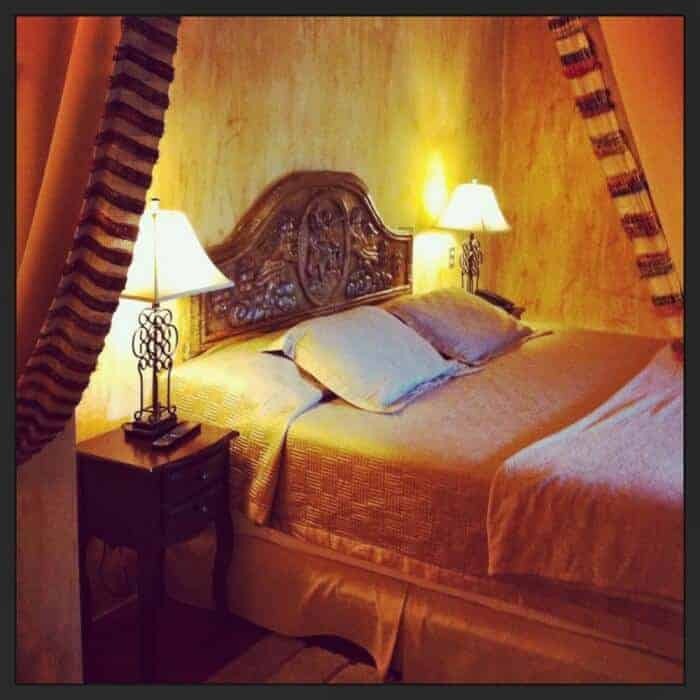 Looking for a budget hotel in Antigua Guatemala? You don’t need to suffer in a grim room or a noisy hostel when you don’t have to. 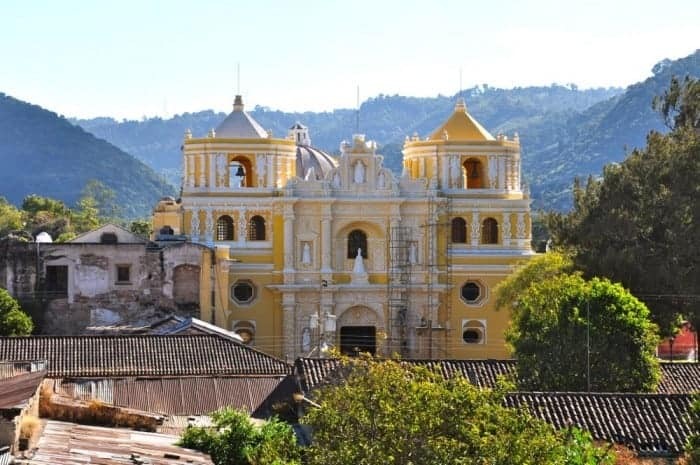 The colonial city of La Antigua, Guatemala, is one of those serendipitous places where being surrounded by beauty doesn’t mean you have to pay a fortune for a nice, safe and clean hotel. This UNESCO World Heritage Site, an hour from Guatemala City, offers plenty of lovely hotels for every budget, including a few I’ve found as low as $35 USD a night. 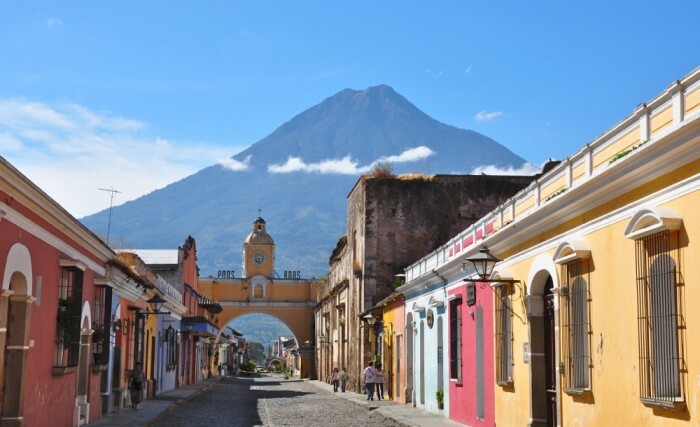 Antigua is a hub for many of the most amazing things to do in Guatemala which means you’ll want to stay there for awhile. It’s worth looking for the best price possible so you don’t overpay. Read on to find my picks for the best budget hotels in Antigua. 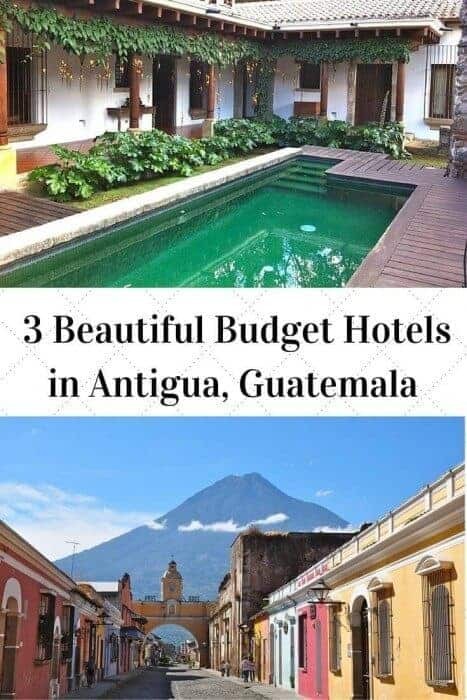 Here are three budget hotels in Antigua, Guatemala for under $100 a night — all are ideally-located, well-run, clean, have private bathrooms and are full of character. I’ve stayed in each one of them and checked them out throughly. 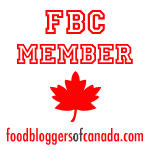 This post contains hotel affiliate links. Please read our Disclosure page for details. 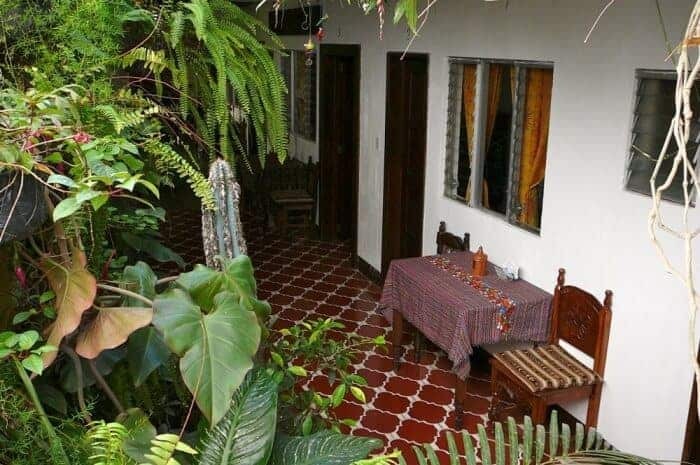 While studying Spanish in Antigua, I chose one of the 7 rooms surrounding the back garden-patio but there are also 16 rooms on a multi-level courtyard in the front patio. The Hotel will arrange an airport transfer from Guatemala City Airport for $36 USD for 1-3 people. 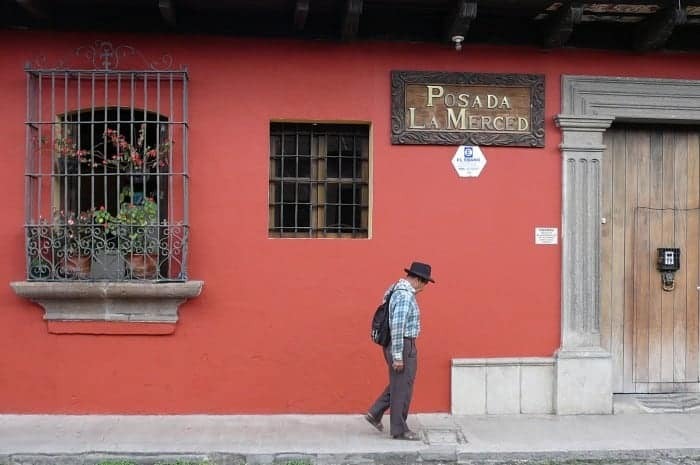 If you’re attending Semana Santa or one of Guatemala’s other amazing festivals, Posada La Merced is a prime location. It’s also very convenient during the Posadas de Navidad as many of the processions depart from the church of the same name around the corner. Check for the lowest price on Posada La Merced Antigua on HotelsCombined.com a search engine that checks Hotels.com, Expedia and other hotel booking sites to find the best deal. It’s also just a few steps to my Spanish language school of choice, PROBIGUA. Read about my favourite language school in Antigua in the post Study Spanish in Antigua. Check for the lowest price on Casa Cristina Antigua on HotelsCombined.com a search engine that checks Hotels.com, Expedia and other hotel booking sites to find the best deal. Set within the restored gardens and archeological ruins of a 17th century convent, this art-filled boutique hotel is well worth the splurge even if you’re on a budget. Rooms begin at around $109 USD a night ( plus tax) for a single but do include breakfast. A double room is $119 so if you’re travelling as a pair the per person rate is quite affordable. The property offers a swimming pool, a rare luxury in Antigua. 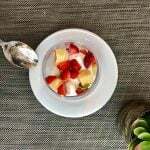 Breakfast is a hot, full breakfast with several options. Located in the Candelaria neighbourhood, it’s quite quiet and tranquil offering the sense that you’ve entered a private sanctuary. The location Calle de los Duelos No. 11, is a bit out of the way, which can be a good thing if you’re looking for peace and quiet. But it is a 10 minute walk to the heart of Antigua. Tiny biting no–see-ums, those gnats that seem to seek me out no matter where I go, can be an issue in the garden area. If you forget and leave your door to your suite open, the pesky insects will find your way into your bedroom and annoy you all night. If this happens, ask the front desk for a package of Raid Laminitas, an electric insect zapper. Plug it into an electric socket and in 30 minutes your room will be free of mosquitos, ants or whatever might be flying around. I always travel with Laminitas, you can purchase a package for under $7 USD in most supermarkets in Mexico and Guatemala. Each insert lasts for 24 hours. The priciest of my three hotel options, the rate of $109+ a night ( not including tax) is compensated by the fact that a full breakfast is included and you’re enjoying a unique and luxurious stay that would likely cost $500 USD or more anywhere else in the world. Check for the lowest price on Hotel Cirilo on HotelsCombined.com a search engine that checks Hotels.com, Expedia and other hotel booking sites to find the best deal. Antigua is closer than you think. It’s just 25 kilometres from Guatemala City’s La Aurora International Airport (GUA), which means that if there is no traffic, you can be at your hotel in just 45 minutes. So, unless you really want to spend time in Guatemala City (and there are lots of reasons to do so) I recommend you travel directly to your hotel in Antigua rather than overnight in Guatemala City. Many hotels in Antigua offer 24 hour service so even if you arrive after dark, you can still check-in. I arrived at Posada La Merced at 2:00 am and had no problem checking in , once the bellman woke up. If you arrive late, look for the buzzer and ring it to wake up the night watchman. Some hotels offer a private transfer service for their guests and that’s worth definitely considering if you’re travelling in a pair. The cost is usually around $36 USD. 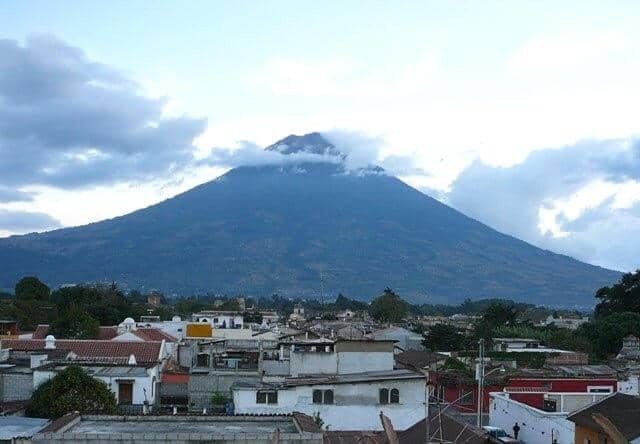 Another option is to book a shuttle from Guatemala City to Antigua with a provider such as Adrenalina Tours. They offer shuttle van throughout Guatemala ( and to Mexico) at reasonable rates and with offices in Antigua, Quetzaltenango and Panajachel, they can take you most anywhere you want to go. The cost per person for a shuttle from Guatemala City to Antigua is $12 USD and you can book online with a minimum of two travellers. The shuttles drop you at your hotel, which sounds convenient, but can be less so if you’re in a full van and the last person dropped off. In Antigua, I’ve bounced around for 30 minutes or more in a shuttle while dropping or picking people up. 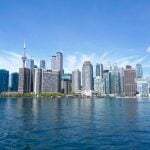 If you’ve had a long international flight, it might be worth your peace of mind and comfort to book a private shuttle. Note that in the shuttles you can reserve the exact seat you want for no extra cost. If you can, try to choose a seat near the front of the van. If you’re prone to motion sickness choose the seat directly behind the driver as there will be less motion and the window generally opens. It’s a short ride to Antigua so where you sit likely doesn’t matter but on long haul trips, you’ll want to specify your seat. It’s also possible to find low cost shuttle services that will offer transportation for as low as $5. In my experience, this is NOT a wise idea. The most recent time I took a budget shuttle, the tires were bald, the brakes squealed like a pen of pigs and the speedometer on the dashboard didn’t work, but I swear we hit speeds of 140 kilometres. The van was also over packed which meant I sat for 5 hours straddling a gear shift stick between my thighs. Not fun, or safe. For more tips on safety, hotel, restaurant and sightseeing tips on travel to Guatemala, check out my post Is Guatemala Safe? Tips for Safe Travel in Guatemala or subscribe to my blog for news and reviews. The hotels sound lovely and the price and amenities are remarkable. Thanks for the caution re bargain transportation! Love the look of the Hotel Cirilo. You should write a guidebook on this. I had no idea it was so easy to get to Antigua from the airport at Guatemala City. 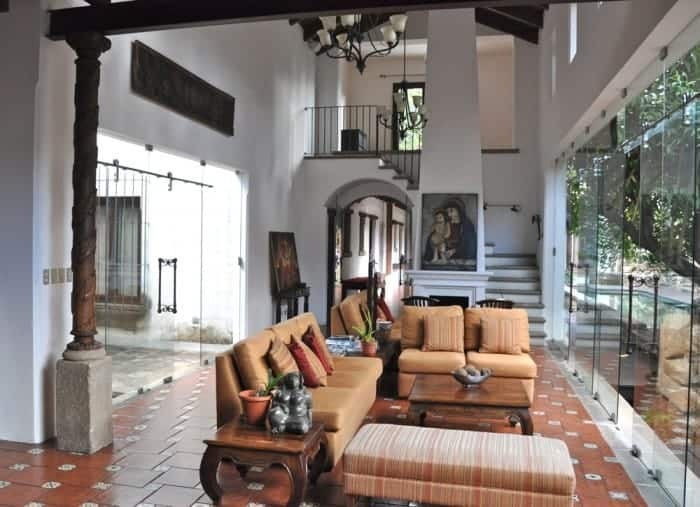 I’d like to stay near La Merced church but Hotel Cirilo looks like an amazing mini-splurge. 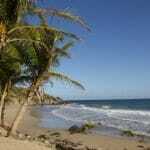 What a great idea to settle in for awhile and sign up for language lessons in Antigua. Haven’t made it to Antigua yet but would absolutely love too visit. The price sounds great for what you get. Depending on where I am in a journey I go for budget or the more luxurious rooms. Would love to stay in the historic hotel and you’re right, when you look at the total amenity package, the price works. Great information and details. I haven’t been to Antigua but these all seem like decent choices for accommodation. I am usually out of my room so much that I do tend to go for less expensive hotels – these are some great options. The Hotel Cirilo looks absolutely enchanting, and if the only con item is as easily dispensed with as you convery, it’s the winner in my book. Price is the equivalent for what you’d pay at a chain motel in the U.S. Crazy! What a helpful guide! 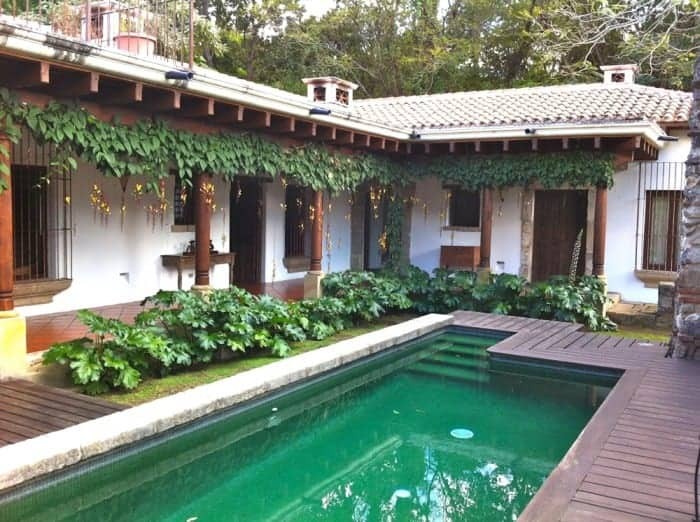 Although all of the properties exude charm, my pick would be Hotel Cirilo. I can’t believe the price! I have to giggle at the offer of the wi-fi amenity, that is quite a valuable resource these days! Antigua sounds like a place I’d like to visit and I like the three hotels you’ve chosen. I’d be happy in any, and am already looking forward to breakfast at Fernando’s Kaffee. Those look like great hotels and you can’t beat those prices! Hotel Cirilo would be our pick! And the price is right too :-). It’s great one can book some affordable luxury (which as you say, would likely cost loads more in other places around the world). Everyone deserves a little luxury every now and then :-). Good to see that type of amazing and luxurious hotels. This three look like some great hotel and i love to go there. Thanks for sharing it.